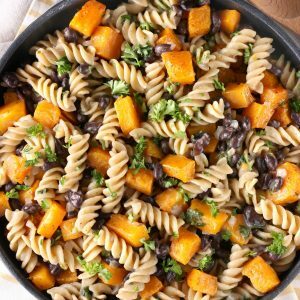 This Butternut Black Bean Pasta Skillet is warm, hearty comfort food that’s on the lighter side. Filled with lean protein, you can feel good serving it up for a great meatless option! *Post and recipe from 09/30/13. Images updated 09/29/17. I have found my new favorite type of squash. I used to love buttercup squash and basically used just that in my cooking and baking. I had butternut before and really didn’t like it. That, and let’s face it, it’s not the easiest squash to peel and cut up! 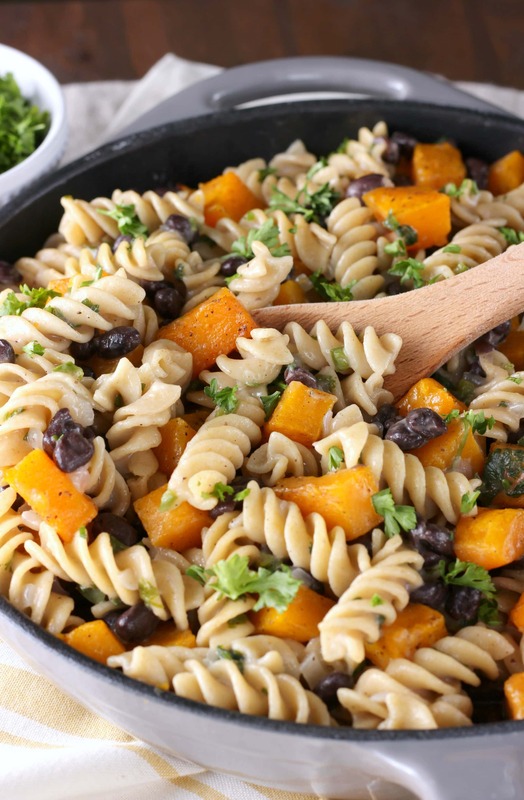 It must have been a bad squash, because after roasting a butternut squash for this pasta skillet, I’m hooked. I could have eaten all of it plain if it weren’t for the fact that I needed to add it to this dish! Though, you can solve that problem by roasting a little extra so you can snitch some while making the recipe! The olive oil, pepper, and nutmeg magically make butternut squash addicting when roasted for 20 minutes. A slight crispy edge appears, and the natural sweetness from the squash becomes prominent. It’s good. And in this pasta skillet, it’s the main flavor that I can’t get enough of. Even my husband who usually prefers to have some kind of meat in his meal, liked this meal! Throw in a jalapeño for a little heat (Trust me, it works). Toss it with pasta, black beans, and parsley. Top it with a bit more cheese (because cheese is always good!). Sprinkle with even more parsley, and serve. The result is a meatless meal that will make you forget that there isn’t meat present! Preheat oven to 425. Line a baking sheet with a baking mat or parchment paper. Add squash and drizzle with 1 tablespoons oil. Sprinkle with nutmeg, salt, and pepper. Toss until squash is coated. Roast for 20-25 minutes or until just starting to turn brown and tender. While squash is roasting, prepare pasta according to package instructions. Also while squash is roasting, add remaining olive oil to a large skillet heating over medium-high heat. Add half of parsley, onion, garlic, and jalapeno pepper. Cook for 3-5 minutes or until garlic and onion just start to brown. Add in chicken stock. Quickly whisk in cornstarch and ginger. Reduce heat to medium-low and simmer for 8-10 minutes, or until mixture starts to thicken. Add in black beans and 1 cup mozzarella. Cook for another 5-7 minutes or until beans are warm and cheese melts. Stir in squash, pasta, and remaining parsley. Sprinkle with remaining cheese right before serving. **Because the sizes of the boxes of pasta vary, just try to use about 7-8 ounces. It doesn't have to be precise. This recipe is adapted from Rachael Ray. I loooove roasted butternut squash – so much easier to cut too, those things are crazy hard! This is beautiful too, I love that top shot for the bottom photo. This looks so comforting and hearty. 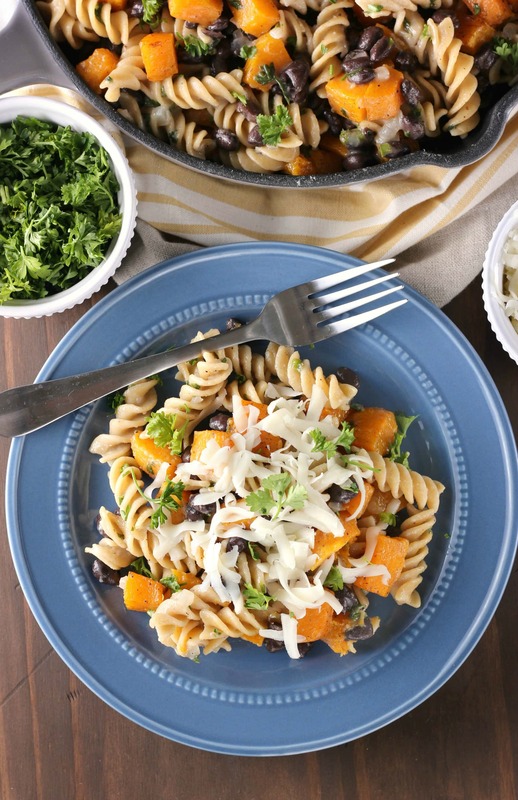 I’m not one to usually use butternut squash, but I’m on a mission this fall to use it more! i love that you added nutmeg to the squash. Makes it sound so warm and cozy. Fall is the best!! I just bought a butternut squash last night….now I know exactly what I’m going to do with it! Yum! 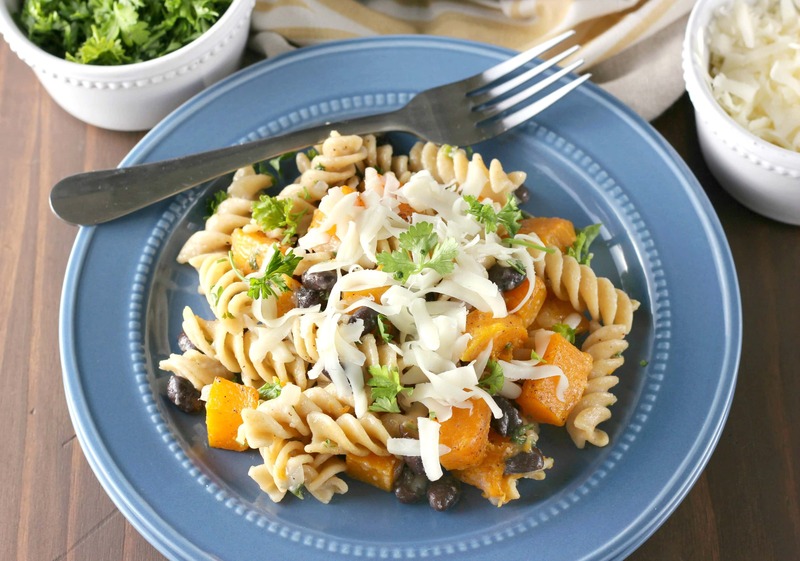 I love butternut squash & love it even more in this dish! Great fall dinner! I love butternut squash. I bet the hint of nutmeg and the spice from the jalapeño make this amazing! Mmmm.. A perfect fall dish! 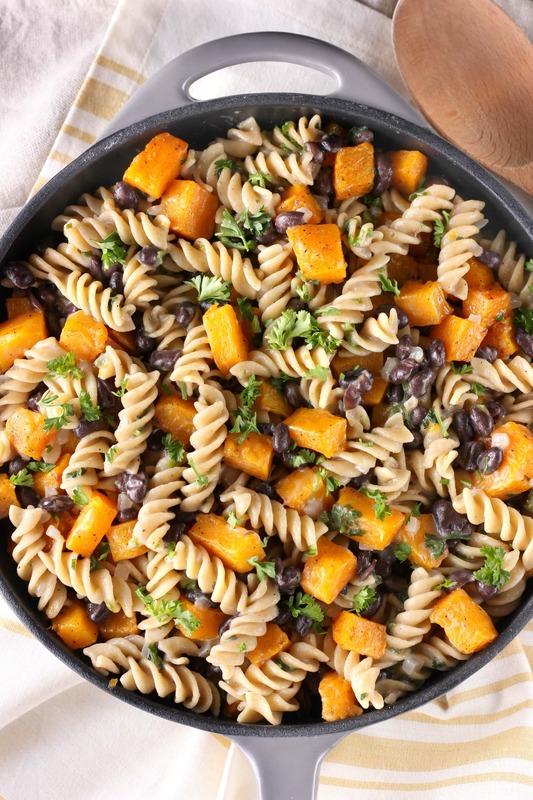 What a yummy fall pasta dish! I adore butternut squash! This has all the goodness of fall in it! I personally I love that it’s meatless 🙂 Pinning! Love pasta skillets like this for weeknight meals. Looks so good! I’m always so happy when I start seeing recipes using butternut squash. So yummy. 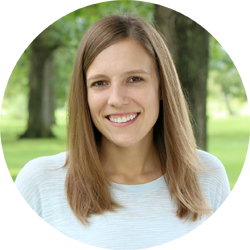 This looks wonderful, Jessica! Pass a bowl(or two) over here! My that looks good!